As expected, the current El Nino has become a strong one, according to NOAA's September El Nino diagnostic discussion released Thursday. Weekly sea-surface temperature departures from average topped 2 degrees Celsius from mid-August into early September in the defining strip of the equatorial Pacific Ocean monitored for El Nino, the Nino 3.4 region. 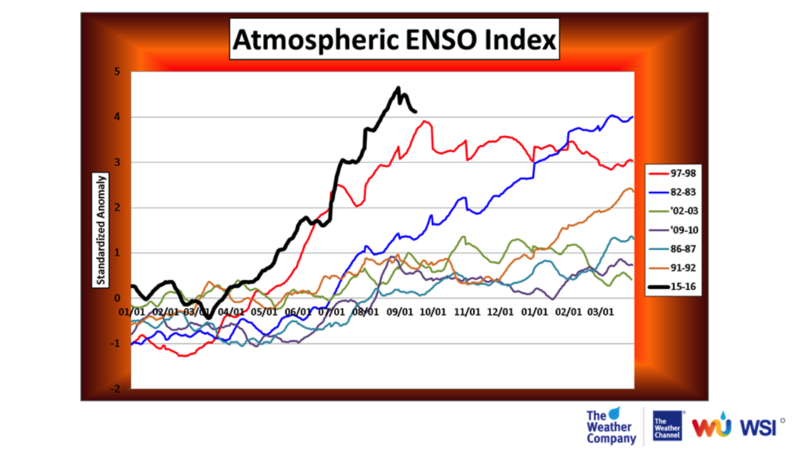 El Nino events are considered strong when temperature anomalies top 2 degrees Celsius. Daily sea-surface temperature anomalies over the Pacific Ocean (degrees Celsius) on Sep. 8, 2015, relative to 1971-2000 average. 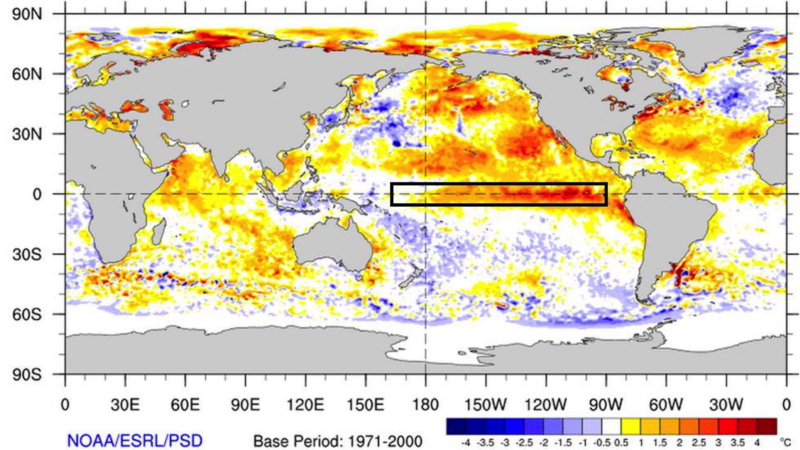 The area highlighted by the black rectangle shows the warmer-than-average waters of the equatorial Pacific Ocean in the so-called Nino3 and Nino4 regions. Significant warm anomalies also were present in the eastern Pacific Ocean west of California and Mexico's Baja peninsula, near Hawaii, and in the north Pacific, while cool anomalies were seen in parts of the western Pacific Ocean east of Japan. Tropical meteorologist Dr. Phil Klotzbach said August 2015 monthly sea-surface temperature anomalies in that strip of Pacific water nudged slightly ahead of 1997 for warmest in the modern era. 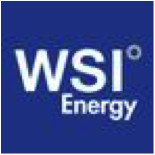 "The atmospheric response to the equatorial sea-surface temperature anomalies, measured by their atmospheric ENSO index (AEI), is the strongest event since at least 1948," said Dr. Todd Crawford, chief meteorologist at WSI, the professional division of The Weather Company, in a September-November seasonal outlook. El Niño is an anomalous, yet periodic, warming of the central and eastern equatorial Pacific Ocean. For reasons still not well understood, every two to seven years, this patch of ocean warms for six to 18 months. This warming of equatorial Pacific water influences the atmospheric pattern from the western Pacific Ocean, including Australia and Indonesia, to North and South America, the Atlantic Ocean, even parts of Europe and Africa. NOAA's September report cited broad forecaster and model consensus this El Nino will persist through winter 2015-2016, before weakening, as most typically do, in spring 2016. Dynamical and statistical model forecasts of three-month mean sea-surface temperature anomalies in the Nino 3.4 region from mid-September 2015 into early summer 2016. 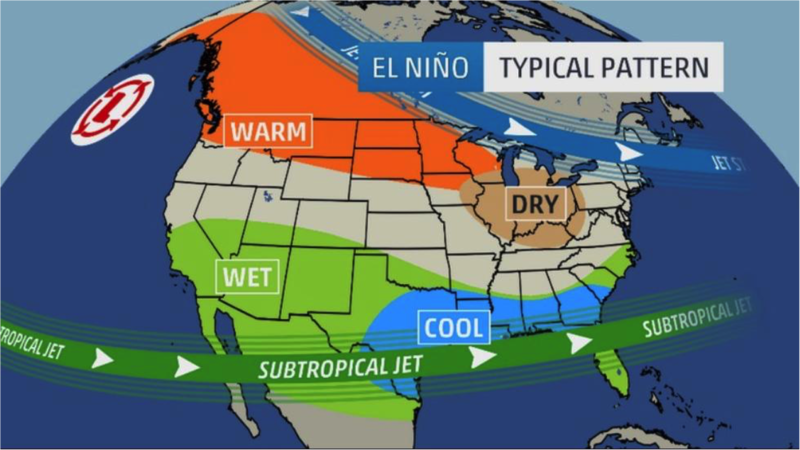 The fact that El Niño is likely to last into spring is important for the United States since precipitation and temperature impacts from a moderate-to-strong El Niño are typically most noticeable during the colder months, from late fall through winter. We have more on what those impacts are later in this article. 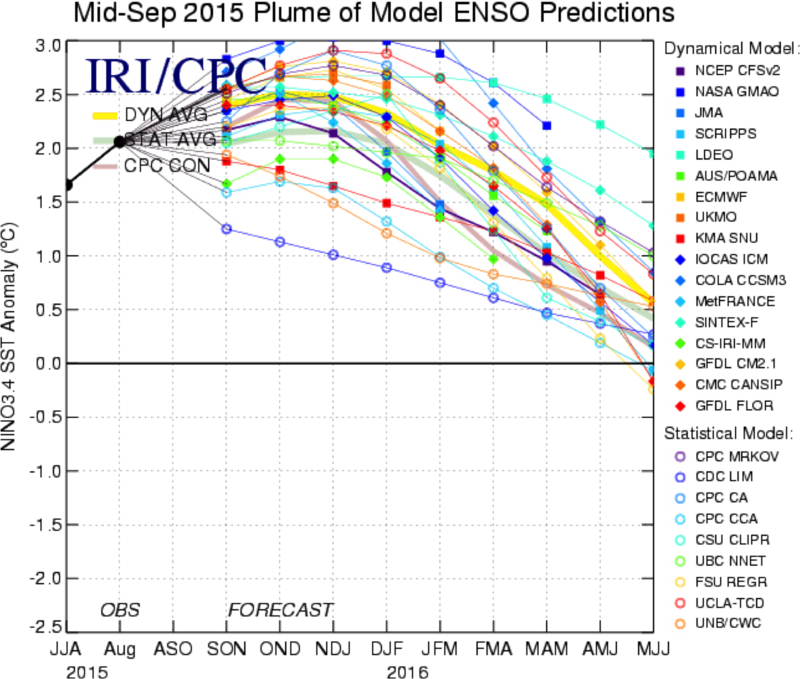 We've likely already seen some impacts from El Niño this summer. For example, a record number of named storms have developed during the central Pacific hurricane season - a basin where we typically see an uptick in tropical activity during El Nino. We've also seen strong wind shear near the Caribbean Sea and other parts of the Atlantic Basin, contributing to the demise of Hurricane Danny, Tropical Storm Erika, Hurricane Fred, and Tropical Storm Grace from mid-August through early September. What else does this warm water have to do with your weather? Schematic comparison of sea-surface temperature and most persistent rain/thunderstorm locations in neutral vs. El Nino conditions in the equatorial Pacific Ocean. Typically, easterly trade winds near the equator pile warm water into the western Pacific Ocean. Conversely, the resultant upwelling, or upward movement of deep, cold ocean water keeps the eastern and central Pacific Ocean cooler. Thunderstorms require at least some degree of warm, humid air near the surface, so they're more numerous and persistent over the western Pacific warm pool, and much less so in the eastern equatorial Pacific. During an El Niño, these trade winds weaken, and may at times reverse from west to east. Warmer western Pacific water then slowly sloshes back toward the central, even eastern Pacific Ocean in what's known as an equatorial-trapped Kelvin wave. Therefore, the most persistent thunderstorms will shift from the western to the eastern and central Pacific Ocean in an El Niño. This trade wind reversal and the resulting reorientation of thunderstorms changes the atmospheric circulation not just over this swath of the equatorial Pacific Ocean, but can also have far-reaching impacts on the atmospheric circulation. Typical jet-stream pattern, temperature and precipitation departures from late fall (Nov.) through winter (Mar.) during a moderate to strong El Nino in the U.S.
El Niño's clearest impact on northern hemisphere weather patterns occurs from late fall through winter. Note these are impacts that are typically expected, but they aren't always the rule. Residents of the western states may remember the flooding that struck California during the strong 1997-98 El Nino. In February 1998, a series of storms caused an estimated $550 million in damage and killed 17 people in California. A total of 35 counties were declared federal disaster areas. This fits into the bucket of the wetter-than-average winter you would typically expect in a moderate or strong El Niño. So, those hoping for drought relief next winter in the Golden State shouldn't immediately draw a conclusion that significant rains are ahead in any El Niño year. The strength of the El Niño can play a role in the outcome. In addition, heavy rainfall can occur with or without El Niño present and that was the case in the winter preceding the strong 1997-1998 El Niño. 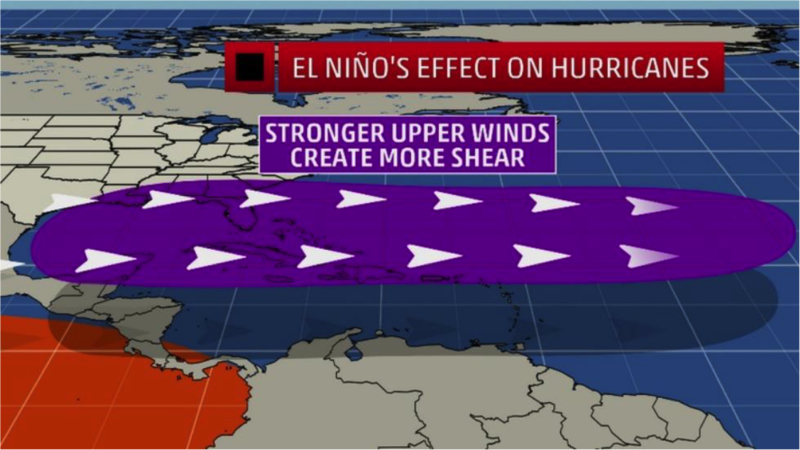 Stronger El Ninos can produce greater wind shear over parts of the Atlantic Basin, particularly the Caribbean Sea. There is a body of scientific evidence linking the occurrence of El Niño with increased wind shear in the tropical Atlantic Basin, which is one factor – along with dry air – that limits the development and strengthening of tropical cyclones. So far this season, we have seen those hostile conditions in parts of the Atlantic Basin. As mentioned before, wind shear and dry air contributed to the demise of both Tropical Storm Erika and Hurricane Danny near the Caribbean. During the 2013 hurricane season, 14 storms formed, but only two reached hurricane strength. Neither of these hurricanes reached major hurricane status, which is defined as Category 3 or stronger on the Saffir-Simpson Hurricane Wind Scale. When considering overall season activity via the ACE index, 2013 was the least active Atlantic hurricane season since 1994. There was no El Niño in place in 2013. Now, consider the 2004 Atlantic hurricane season. Four hurricanes - Charley, Frances, Ivan and Jeanne - hammered Florida in less than six weeks. There were 15 storms and nine hurricanes that season, which is an active one by any measure, and it developed despite a weak El Niño. Taken together, the five El Niño hurricane seasons since 1995 averaged about 11 storms, 5 hurricanes, and 2-3 major hurricanes, a reduction of four storms, 3 hurricanes, and 1-2 major hurricanes from the average since 1995. Prior to the current active phase of Atlantic hurricane activity (pre-1995), there were several other relatively slow hurricane seasons: 1982, 1986, 1987, 1991 and 1994. The 1982 season was particularly inactive, with only six tropical storms and two hurricanes. The next year, despite one of the strongest El Niños on record finally fading by early summer, only four storms formed the entire season. Exactly where the equatorial Pacific Ocean warms in an El Niño matters, as well. 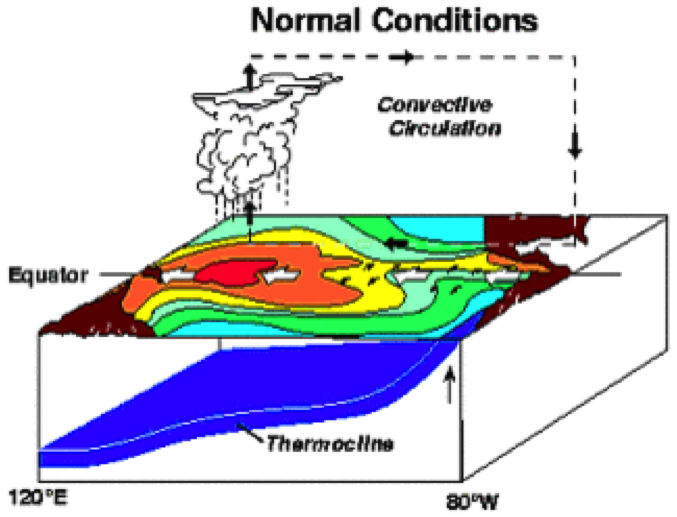 As we've stated, El Niño is only one driver of the atmospheric circulation. Wind shear over the Atlantic Basin may be less on some days, despite being higher when averaged over an entire season. While we have focused on numbers of storms and hurricanes, it's ultimately a storm's path that matters for impact. "Even if we get a strong El Niño, that doesn't mean no U.S impacts (from hurricanes or tropical storms)," says Dr. Phil Klotzbach, a tropical meteorologist and researcher at Colorado State University. Klotzbach notes that Hurricane Betsy hit both Louisiana and Florida in 1965 and Agnes flooded out the eastern U.S. in 1972, both during strong El Niños. All it takes is one intense, landfalling hurricane to make many forget an El Niño was even there. Meanwhile, the eastern, central and western Pacific Basins remain very active. At one point in mid-July we had six active tropical cyclones across the Pacific Ocean at the same time. Colorado State University tropical scientist Phil Klotzbach found tropical cyclones are about three times more likely to impact Hawaii in El Niño years vs. La Nina years. So far this season, a record five named storms have developed in the central Pacific basin (Halola, Ela, Iune, Kilo and Loke). In addition, four named storms have crossed into the central Pacific from the eastern Pacific (Guillermo, Hilda, Ignacio and Jimena). Fortunately, Hawaii has missed out on significant impacts other than high surf from the storms that have passed close to the islands so far. Ultimately, this El Niño will exert some influence on the numbers. However, all it takes is one tropical cyclone making landfall in a populated area to change perceptions of an active season.